We had a hugely successful first meeting of the year on Wednesday 15th, with an excellent turnout including many new faces and some we hadn’t seen for a while plus a brilliant speaker in Joseph Atkin from Aberglasney. 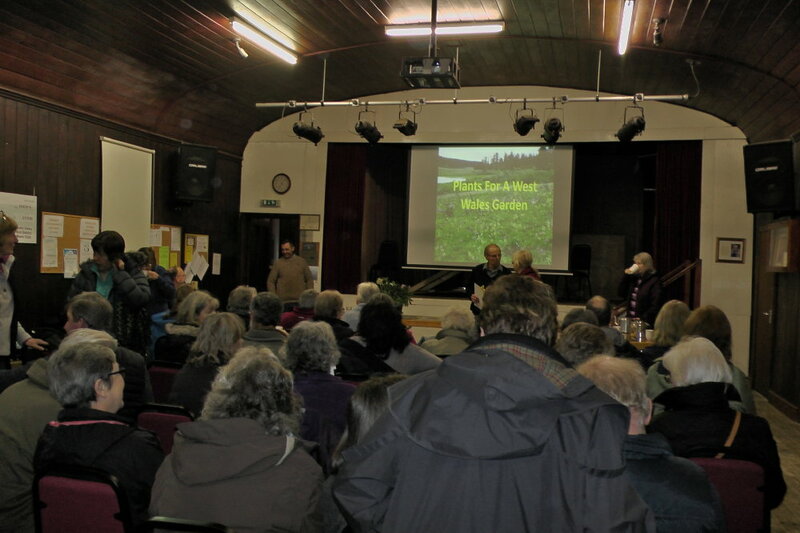 Joseph’s talk on plants for a West Wales garden was interesting, amusing and informative. He confirmed many of our views that we are fortunate to live in an environment that enables us to grow a great range of plants, particularly those native to China and the Himalayas – as long as we can control the slugs. He showed us some old favourite plants together with some lovely new ones, particularly some of the species lily family and gave us some very useful tips on propagating from seed and how he deals with slugs at Aberglasney. The club plant stall was well supplied with some excellent plants so very many thanks to those who brought plants and to those who bought them. The proceeds are an essential part of raising funds so that we can continue to enjoy a wider range of speakers each year. Julian, our new Chair, fortunately sailed through his first meeting without running aground. 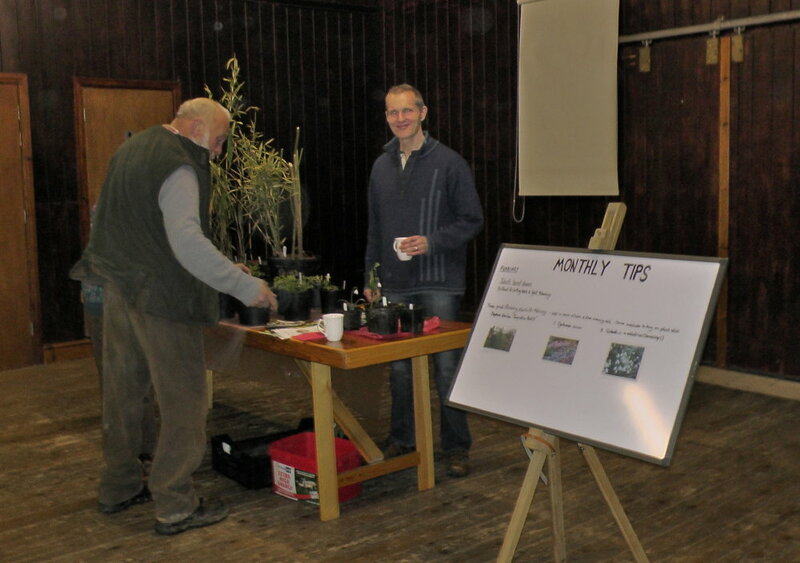 He introduced a new 5 minute slot for members to share any topical tips, plant favourites, etc with the rest of the club, kicking off with a couple of his own, and brought the club’s whiteboard into use to highlight some of the plants mentioned. Our club has an enormous font of knowledge and this is an opportunity for everyone to share in it, so if you have something you think would be of interest to other members, then do please get in touch with Julian well in advance of the next meeting so that it can be included in one of these slots. Jakoti hand shears. One of the most useful tools we’ve come across. They have a longer blade than secateurs, can be used with one hand easily and cut more in one go than conventional shears. They are also self sharpening. Available online for £30-£35. a) Cyclamen coum. Copes with anything the weather throws at it. Flowers from November through to March/April. Grows in free draining soil in semi shade. Maybe best on a slope – if you haven’t got a slope try making a sloping raised bed area, beneath a tree or large shrub. b) Galanthus x valentinei. A lovely vigorous snowdrop out in time for Valentine’s Day, which has appeared in our garden – we really don’t know if it’s a seedling cross, since we have no record of ever buying it. 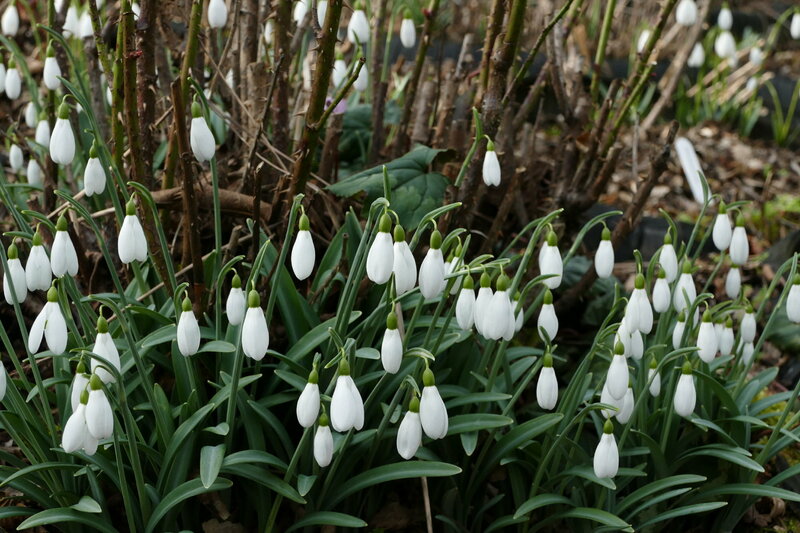 Best planted like most snowdrops beneath a deciduous shrub or tree. c) Daphne bholua Jacqueline Postill. Heavenly scented flowers from December through March. Well drained soil, semi shade. If you can get hold of one on its own roots, it will sucker like a wild cherry and you’ll end up with plants eventually up to 7 feet tall, covered in these scented flowers for up to 2 months. The club growing challenge this year is for members to grow something that they then incorporate into a dish that they bring to the meeting in August to share – along with an example of what they have grown or photos if that is not practicable. Members can then share their ideas, successes or failures and sample the results. It is hoped to hold the event at Gelli Uchaf or, if the weather is bad, in the Coronation Hall as normal. Thank you to Brenda for the idea for this year’s challenge. We are planning an all day trip over the border at the end of May/early June to see two gardens that come highly recommended. The first is Westonbury Mill Water Garden (click here), entry £6 and the 2nd is Hergest Croft (click here) entry £6.50. The plan is to go by car and meet up at the gardens, having lunch at one or the other – both have cafes. 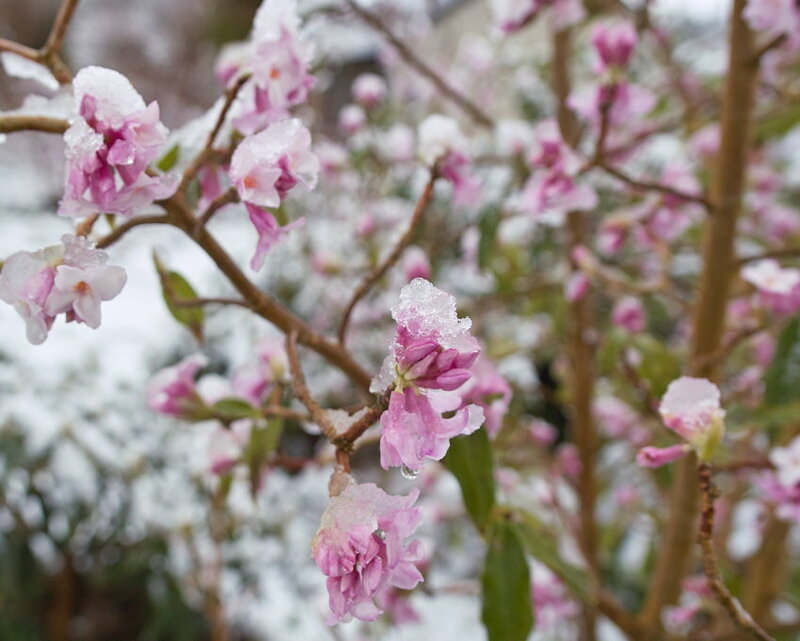 The timing should be excellent for Rhododendrons. There will be a form for anyone interested to sign at the March meeting. If you would like to add your name but can’t make the meeting then let either Julian or Fiona know. We are planning on having another Pie Night get together at the Dolaucothi Arms before the next meeting. We will meet at 6pm to eat at 6.15pm. Dave and Esther kindly allow us to come early so that we can get to the meeting on time. In order to do this we need to let them know our pie choices in advance, so anyone who would like to join us needs to let Julian know by Friday March 3rd so that we can get menus out and choices in in time. So with Spring just around the corner and if you’ve already enjoyed the cheerful sight of Snowdrops and Crocus recently, why not give some attention to the vegetable garden in coming weeks? To get you started, we have invited Ivor Mace to give a talk on March 15th. Ivor has over 40 years of growing experience and has won prizes for his show onions and leeks. He’ll tell us about soil condition, pH levels and no doubt recommend varieties which should do well in your garden. 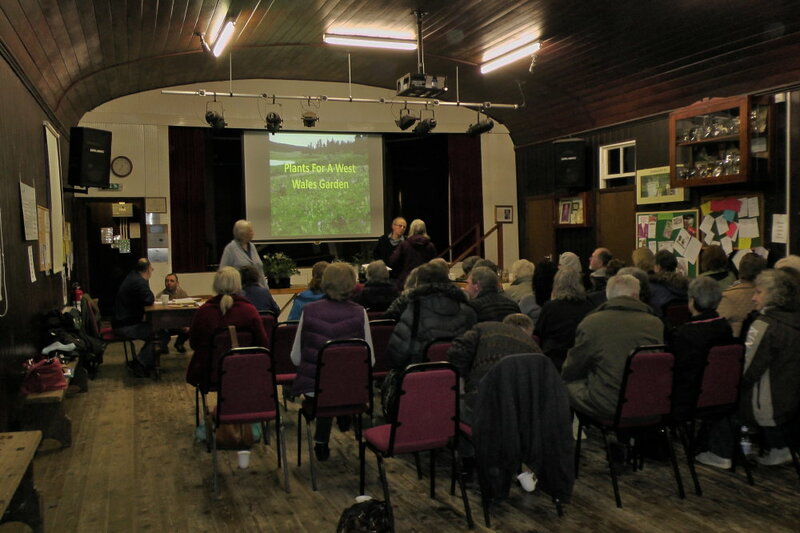 There will be time for questions and answers at the end of Ivor’s talk so if you fancy having a go at growing a prize winner for your local horticultural show or would like to add some home-grown veggies to your dinner plate, then come along. Even if you don’t have space for a vegetable plot, a few container-grown plants will add vitamins and minerals to your diet and the whole family can enjoy eating what they’ve grown. Join us on March 15th at 7.30pm, please note the later start time.